1. Integrated touchpad takes the place of your mouse. 2. Two-button for true mouse performance. 3. Easy to use, simply glide your finger over the touchpad. 4. Small and lightweight - fits anywhere - extremely portable. 5. 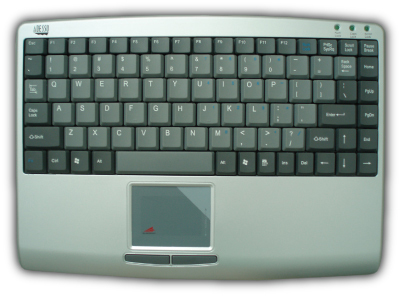 Includes embedded numeric keypad and 12 function keys. 6. Low-profile tactile keys for quieter typing. 7. Membrane key switches provide longer life. 8. Lighted LEDs for Num, Caps, and Scroll Lock. 9. Two functions combined in one device. 11. LEDs indicate status of operating functions. Do you need a pointing device, but you don't have enough room for a separate mouse? In that case, the ultra flat compact keyboard with integrated touchpad will solve your problem. Now it's easier and more affordable than ever to enjoy Adesso quality and performance in a touchpad keyboard. The Adesso SlimTouch Mini keyboard combines the control of an integrated touchpad with the features of a standard keyboard to provide a small yet powerful input device. The touchpad includes a scrolling area that scrolls up and down for faster browsing and it can be upgraded to a 4 way scroll with the GlidePoint 3.3. driver. It's perfect for Slimline PCs and notebooks and limited space areas. Indicate status of operating functions. 12.75" x 9.1" x 1.25"